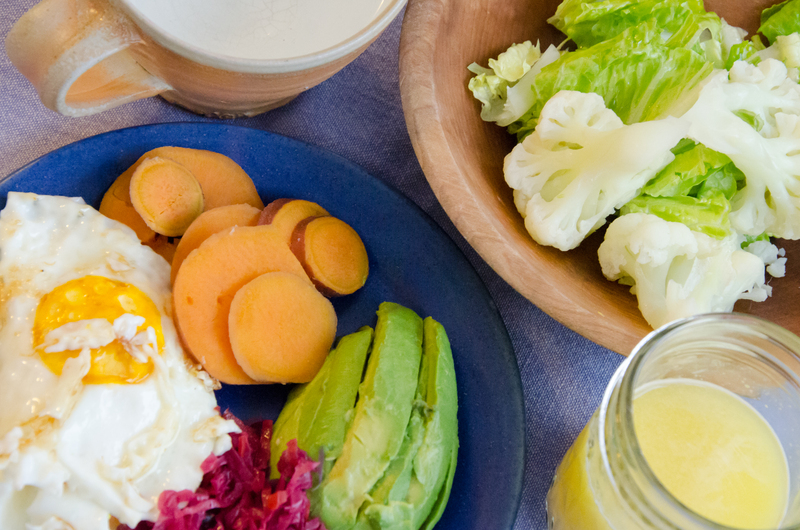 two farm eggs sunny-side with ghee, steamed sweet potato, ruby kraut with carrots, avocado, steamed cauliflower, romaine with olive oil, nutritional yeast drink, and “silver tea” aka hot water. I’ve noticed that my meals are consistently rainbow-licious. And what’s cool is that I’m not consciously making them that way. I’m not sure if it’s just that I have internalized the idea that it’s healthy to eat a variety of colors, or whether my body just knows how to get all its bases covered. Either way, I am often delighted at the beauty of my meals, and find that my body feels good too.